The normal price of the Sunday Bag is $39.95. If you order it this month, the cost is only $29.95 plus an additional 10% discount if you order 3 or more clubs. Just enter "10%" (without the quotes) in the Coupon Code during checkout. 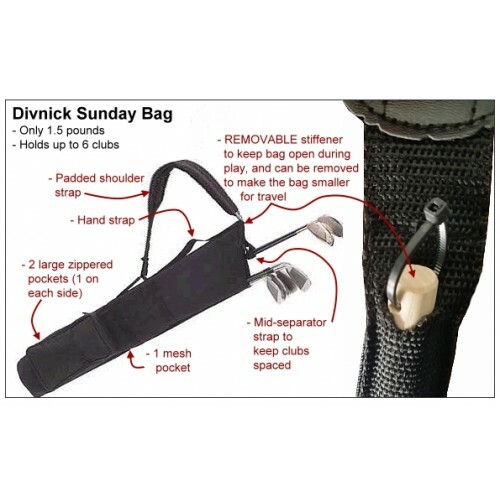 The durable, lightweight bag has an adjustable shoulder strap, a hand strap, 2 convenient zippered ball and accessory pouches, a mesh pouch, a mid-separator strap that keeps all the clubs from bunching together, and a removable stiffener. With the stiffener in place, it makes the bag easier to carry and holds it open for easy replacement of clubs. With it removed and your clubs collapsed, the bag can be folded over to fit into your suit case. It is perfect for carrying your telescopic driver, putter, and adjustable club, along with two or three additional clubs if you wish.